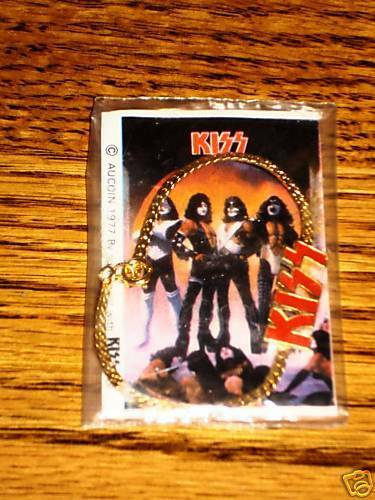 Home » roundaboutrecords' booth » KISS ORIGINAL BRACELET 1977 AUCOIN SEALED ! KISS ORIGINAL BRACELET 1977 AUCOIN SEALED ! Thissale is for A KISS ORIGINAL Aucoin Bracelet Sealed in the original bag, AUCOIN 1977. The bracelet is gold colored and the KISS logo is in red letters. This is an extremely rare KISS original item. It is in perfect mint condition still sealed. If you are looking for an awesome piece of KISS original memorbilia, here it is. International Buyers Welcome - Email Me For Shipping Charges! PLEASE SEE THE MANY OTHER GREAT ITEMS I HAVE IN MY STORE!